Women’s magazines aren’t just brainwashing you into believing you must be young, thin, blonde, and beautiful. They’re also brainwashing you into believing you must eat dairy to be healthy and fit. I’m always encouraging people to do their own vegan and vegetarian research. Browse blogs for recipes and to learn from other people’s experiences. Read read read read READ – especially classic books like The China Study, Diet for A New America, Becoming Vegan, What To Eat, Food Politics, and Fast Food Nation. Watch a few movies like Forks Over Knives, Supersize Me, and Food, Inc.
And, also – be aware that there are large and powerful forces out there that do NOT want you to be vegan. (No, I’m not talking about Satan or your mother-in-law.) I’m talking about the USDA – United States Department of Agriculture – and the National Dairy Council, among others. These government funded agencies invest heavily in marketing campaigns designed to keep everyone drinking milk (or eating meat, or eggs). Truly an ongoing example of brainwashing at its finest. But most of us who’ve been vegan for awhile know how to recognize that kind of advertising. Which may be why advertising is getting steadily more insidious. Like in women’s health and fitness magazines. I was flipping through a couple this morning. Ok, I’m smart enough to know that unless I’m reading VegNews or possibly an alternative health magazine, there are going to be recipes that feature meat or fish or dairy. And I don’t have a problem with that – I just flip right over them. Which was why I was a bit surprised when the November/December copy of Fitness started seeming like one huge ad for the dairy industry, even though I was avoiding the recipes! p 17, “I Lost 224 Pounds!” “Fruit is the best way to tame my sweet tooth. I toss pineapple and banana slices with vanilla yogurt.” If fruit is the best way to tame your sweet tooth, why the sugary vanilla yogurt? p 73 – An ad for Smart Balance milks targeting children 12-24 months and 2+ years. p 124 – One of the “6 Fat Fighting Superfoods” – Whey Protein. “When you’re losing weight, eating whey protein can help reduce the loss of lean muscle mass, which keeps your metabolism revved,” and “Whey protein powder isn’t just for smoothies. Mix it into yogurt and pudding or add it to the dry ingredients when you’re baking muffins or cookies.” Because you just can’t add too much powdered milk to food! p 140 – “Take It Cheesy” – French Toast Sandwiches with Turkey and Swiss, which calls for 5 large eggs and Swiss cheese. Yes, I actually flipped back to the cover of the magazine to be sure I was reading a health and fitness magazine when I saw this one. Inside back cover – “Our After. Alone, we train hard. Together, we train harder. We refuel with lowfat chocolate milk to get back essential nutrients, and for high quality protein to help rebuild. So we can push even harder tomorrow. Got CHOCOLATE milk?” Featuring members of the USA Swimming Team (and the Got Milk? campaign). p 38 – “Getting Piggy With It” – “People whose breakfast contained pork were less hungry at lunch than those who just ate eggs, toast, and an apple.” Fitness’ recommendation: Eat bacon and turkey sausage. Hmmm. 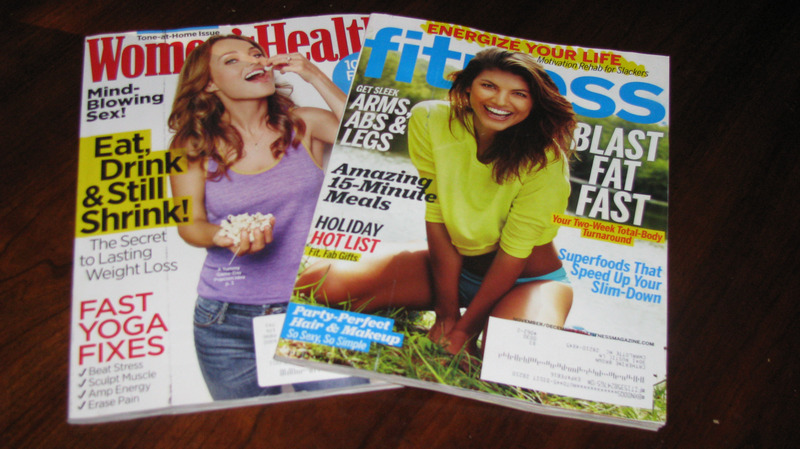 I knew women’s magazines try to brainwash us into a certain media perception of thinness, blondeness, and beauty. But this? Were all women’s health and fitness magazines like this? I next picked up the November issue of Women’s Health. Cover – Giada, Celebrity Chef, is eating what appears to be plain popcorn. On page 3, it’s revealed there’s actually butter and cheese. Ok…buttered popcorn is kind of the norm. p 12 – How I Reenergize My Day – Orange-Carrot Juice. Hmmm! It’s vegan! p 23 – Natural Energy – “It turns out that a banana is effective workout fuel … Study authors say bananas seem to have a near-perfect mix of carbohydrates, potassium, vitamins, and antioxidants.” So they’re actually recommending bananas – without yogurt. Interesting. p 86 – A recipe section on “Winter Greens,” featuring 2 vegetarian recipes and 2 vegan. p 92 – Ad for Healthy Choice Four Cheese Ziti Marinara. p 93 – Ad for Healthy Choice Greek Frozen Yogurt. p 94 – 3 recipes for butternut squash, two vegan and one vegetarian. p 100 – An actual recipe for a tofu scramble. p 152 – A recommendation for kefir (because of up to 50 different probiotic strains) for those who are suffering from gastric distress. Be careful of what you read on a regular basis … Are your magazines supporting your lifestyle, or trying to undermine it? Understand that others may be reading the cr*p you are not, and that could be influencing their opinions (and hence their support or non-support of your lifestyle). And surround yourself with positive people that support you, AND positive media that supports you! I was recently horrified to hear a medical doctor on T.V. say that, not only do pre-menopausal women need extra iron (as a supplement), but so too do ALL vegans and vegetarians. However, my family internist, Allen Wong, M.D., chastised me once when my blood work came back with elevated iron. (I had been taking a multivitamin with iron.) Dr. Wong correctly said that ALL men over the age of 50 usually get adequate iron, and that elevated iron levels like mine could be indicative of various disease processes. When I quit taking the multivitamin with iron, my iron blood level had normalized. That’s a good point, Cragdude … we need to be careful of the information we get from the TV as well as information we get from magazines! Most vegetarians and vegans tend to eat a lot of dried beans and dark leafy greens which are excellent sources of iron. I’m glad your family internist was sharp enough to notice your elevated iron and had you quit taking your iron supplement before you developed any health problems from it! You’ve got a great doctor!